I’ve seen Ricky do his stand up a few times now and he is getting better and better everytime, with his gags getting stronger and stronger. Just the other night I saw him on stage at a benefit event where Bruce Springsteen performed. A few hours before this event I caught up with him at the HBO building near Bryant Park in New York City. He took me into a small conference room which was strewn with left-over McDonalds food and cans of coke. He loves eating filet o’fish! 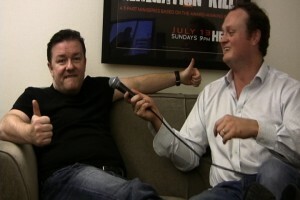 This was my 7th interview with Ricky over the last 4 years. This interview is about his stand up show which was taped at the Kodak Theatre in Los Angeles and Madison Square Garden in New York. He gets very serious when discussing the craft of stand-up comedy; a craft that he has started late in his career compared to other comics. And the cross-over of his gags to an American audience seems to be going great. The other night at the benefit event there were people in the audience who had never heard of him who had flown in from all over America. Initially the crowd giggled at his jokes unsure where he was going. By the middle of his performance everyone from teenage girls to a group of marines, to their mothers were all in fits of laughter. He did his AIDS-prevention pamphlett routine that brought the house down. See it in the HBO special OUT OF ENGLAND on HBO on November 15th at 9pm.